Relaxing, well equipped three bedroom holiday home on a quiet no-exit street. Upstairs is the master bedroom, complete with TV, en-suite and your own balcony - relax in the morning with your coffee, overlooking the water - the perfect start to your day! Downstairs is another queen bedroom opening onto the deck, a twin bedroom and bathroom complete with bath. All linen provided. Open plan kitchen, dining and lounge area with a large flat screen TV. Living areas open onto the deck and the view. Large front and back lawns with lots of room for parking and playing. There are also two sit-on kayaks available for guest use - perfect for exploring the estuary! Local cafes, takeaways (world famous on the coast), well stocked superette and hairdresser are an easy stroll away. 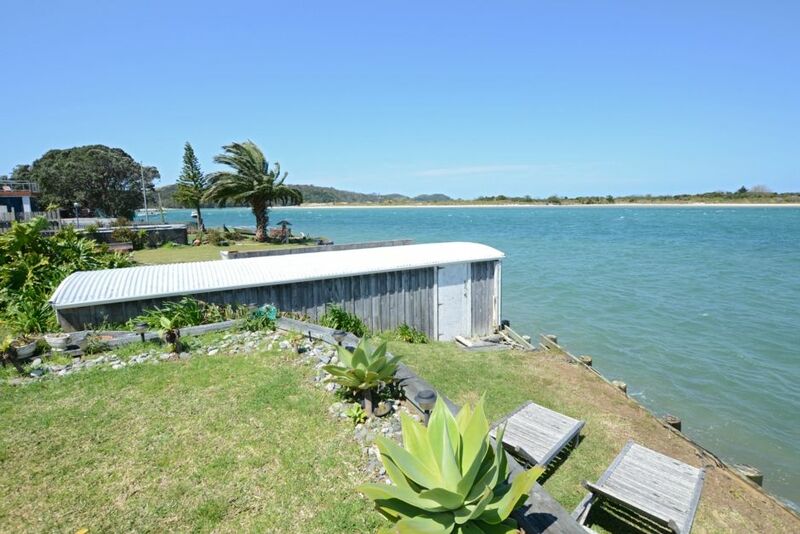 Boat ramp, golf course, tennis courts, petanque and children's playground are within an easy walking distance also. The Tutukaka coast is well known for it's stunning beaches - Matapouri, Whale Bay, Sandy Bay (renown for great waves, and regular surf comps) and Whangaumu Bay are all within a 10-20 minute drive .Tutukaka Marina with it's world famous fishing and diving charters, cafes, hotel and gift shops are only a short drive over the hill. And of course there's swimming just off your front lawn! There are plenty of fishing spots both on the estuary and at surrounding beaches - schnapper, kahawai, trevally, John Dory and more. And a gas BBQ at home to cook your catch! Come here to relax, unwind, swim, fish or whatever you choose - the perfect spot for your kiwi beach holiday, any time of the year! "Amazing location with stunning views. Even better, caught fish off the backyard and pipis fresh out of the water yummo!" "Awesome place, we got a good sized snapper within half an hour of getting here! Then a kingfish!" Minimum stay requirements over Xmas/New Year period on application. 3 night minimum stay for holiday weekends. $250 refundable bond applies to all stays. Please note there isn't a fence between the lawn and the water so it may not be suitable for toddlers. We had the best time swimming,fishing and watching all of the majestic stingrays! The bach had everything we could have needed and more....very well set up. This was perfect for our group of 5 adults and 1 child. The location was awesome - fishing, swimming & kayaking off the front lawn was pretty special. Thanks for having us! Wow, amazing location and boathouse with dingy and kayaks a bonus. House is much more spacious than the photos show. Very well equipped property and we will certainly be back. Fantastic location right on the water. You can spend hours on a sunny day dipping your toes in the water just watching the fish swim by or launch the boat/kayaks from the backyard to paddle along the estuary. The one negative: the house creaks at night as it cools down and it's really loud. Light sleepers beware! Unfortunately due to a family bereavement we were not able to join our family on this trip. Unfortunately due to a family bereavement we were not able to join our family on this trip. It is, therefore difficult for us to comment on the property. However, having spoken to them, they enjoyed there stay.